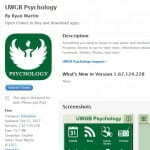 H ave the EPIC agenda, handouts, campus maps, and more at your fingertips with UW-Green Bay Psychology Smartphone App, available through iTunes and Google Play. UWGB Psychology is really a very useful app. Thanks for sharing.